Attractive, works well, and easy to use. Pretty good value too in our opinion, especially if you're tracking down that perfect cream microwave. None to speak of - the mirrored door may divide opinions somewhat. 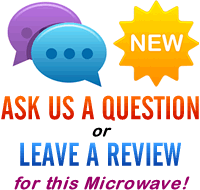 We've already reviewed this microwave, albeit in a red colour scheme - so you might want to read that review for a more in depth insight into this appliance. The C at the end of the RHM2064C product name stands for Cream - essentially this is an identical model, asides from the colour - designed to appeal to those who are after cream appliances for their kitchen. This particular budget model features a 20 litre capacity, 800w of power, and based upon our test of the equivalent model in red, works well and is pretty reasonably priced. The glass turntable is removable, and the digital timer is clear to read. The controls are pretty simple to operate too. So why should you buy this model? 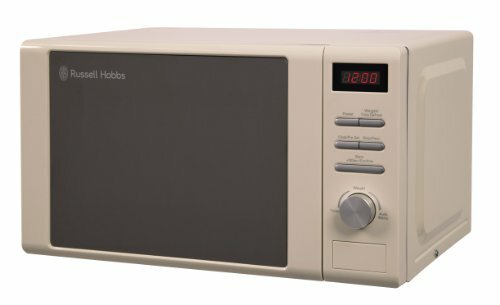 In all honesty it has a fairly standard specification - most microwaves in this price bracket will be 20 litres with 800w of power, with 5 different microwave levels. The main selling point is the colour - there isn't a great deal of choice if you're after a cream microwave. Russell Hobbs appliances tend to be fairly reliable - so if you're after that elusive cream microwave, then we'd recommend looking at this RHM2064C model. If you're after a cream microwave, then you won't have too many options - that said, this solo model seems to be pretty reliable and should serve you well. It's well built, easy to operate, and our test team were positive about it.